When I bought this Sheppee, it had been in storage since the early 1980s. It had only one owner registered in the old and new logbooks prior to my ownership.It has now been recommissioned in our workshops and is running well. Some of the pictures below were taken when I first bought it: you can see it was quite dusty. Other photos, taken more recently, show it thoroughly buffed and polished. 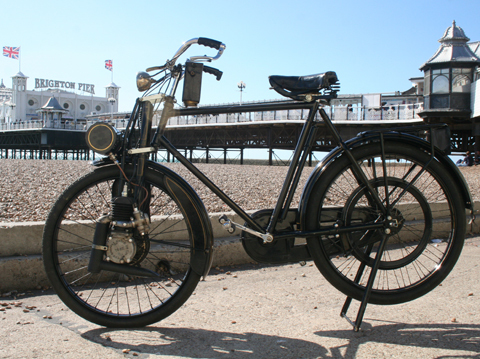 This Sheppee Motorized Gents Bicycle was first registered on 26th August 1924. It’s remarkably well-preserved for an 85-year-old vehicle. 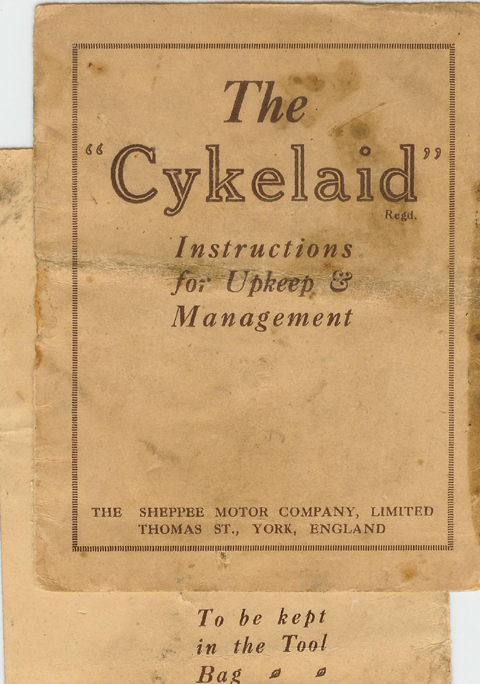 This was the 141st Cykelaid to leave the works of Sheppee Motor Co Ltd, and was purchased by Mr. S.W. Webb, one of the partners in the Cheltenham car dealers Clifford & Webb. 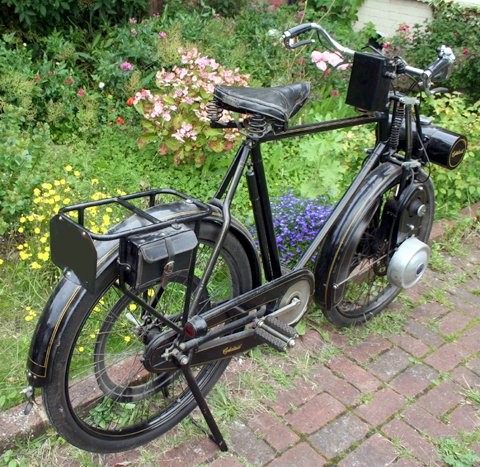 You can tell that the bicycle was sold as a complete unit because the frame has a similar number to the engine. Mr. Webb actually bought two of them, a Lady’s and a Gents. His sister preferred this one, so he rode the Lady’s model. But she didn’t use it for long as she found it awkward to ride. The addition of an engine on the front wheel certainly does make a bicycle heavier. I purchased it from Chris Tee, whose father worked for the company as a mechanic. Mr. Tee Senior (Brian) and Mr Webb used it for riding between Clifford & Webb’s various workshops in Northleach, and it was then subsequently parked up. It remained in storage for 25 years – until Mr. Webb and Brian Tee met again at a company anniversary celebration in the early eighties, and Brian ended up restoring it for Mr. Webb. 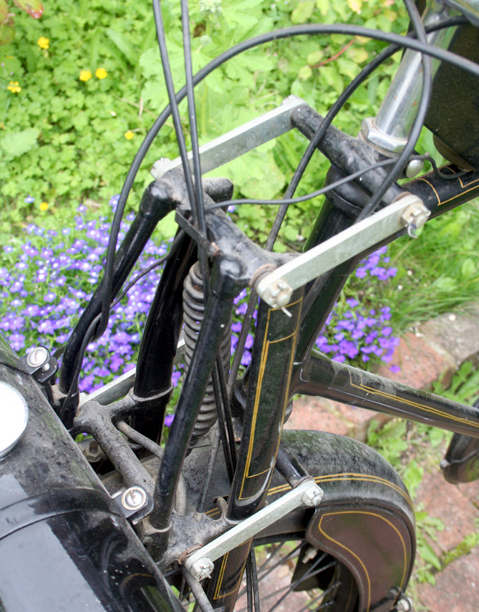 The handlebars were re-chromed, the cycle was repainted, and the engine restored. They could only find new tyres in Devon, so had to drive there to buy them. Unfortunately, Mr. Webb passed away before completion of the work, and Mrs. Webb gave the bike to Mr. Tee as a reward for his long and loyal service to the company. 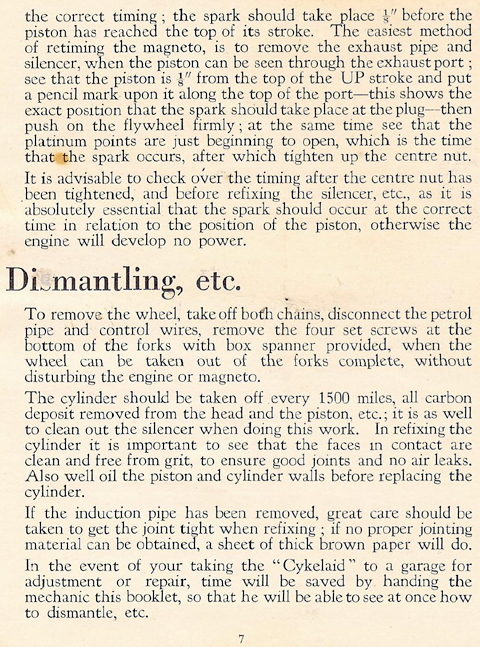 Though the advert above quotes an engine capacity of 1 3/4 hp, the description below (and others I’ve seen) show a maximum engine capacity of 133cc. 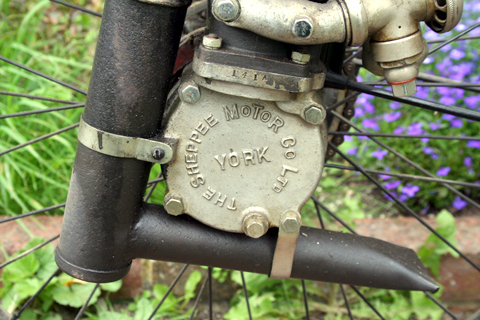 The original logbook for this Sheppee records it as 1 1/2 hp, and the catalogue further down the page mentions 1 1/4hp. 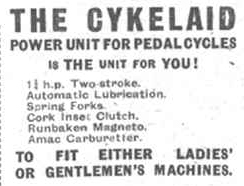 The Cykelaid made its debut on Stand No 49 at the Cycle & Motorcycle Show, Olympia, in 1920. 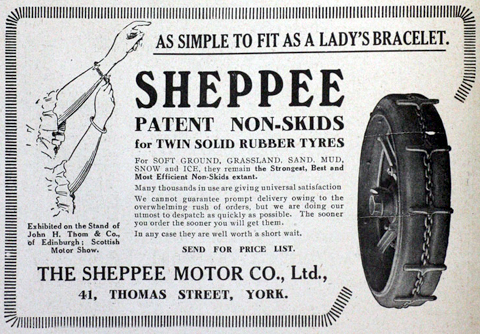 The founder, Colonel H.F. Sheppee, had already been manufacturing steam-powered vehicles, making fourteen different models over a ten year period. * 1921 In production the complete power unit was carried on a special front fork, with the 104cc two-stroke engine on the left with its main-shaft run through the wheel spindle to a flywheel. 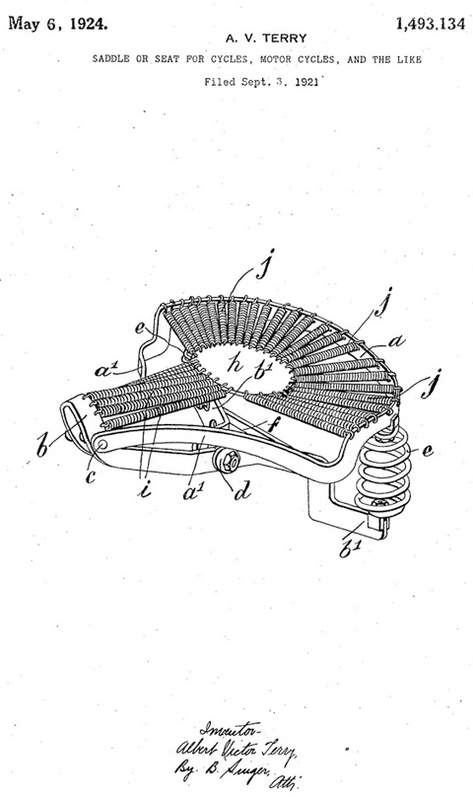 Ignition was by chain-driven Runbaken magneto bolted upside-down to the crankcase base, and transmission was by chain up to a counter-shaft carrying a clutch and then back to the wheel by a second chain. 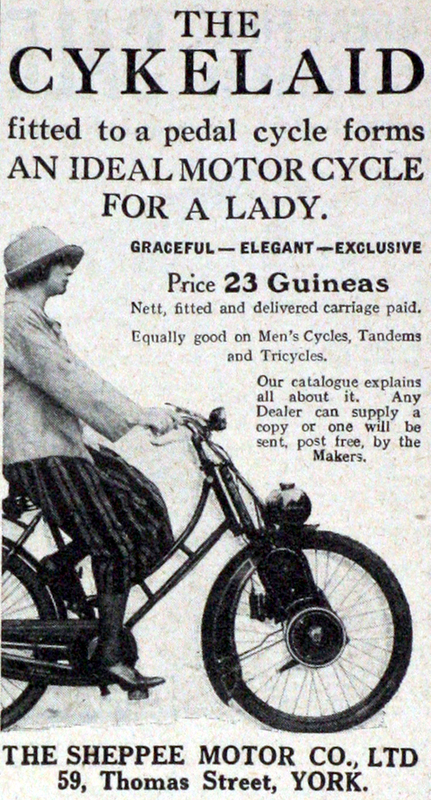 The firm offered a package of wheel, engine unit and front fork or the choice of complete ladies’ or gents’ machines. The complete Cykelaid could be purchased for £50. 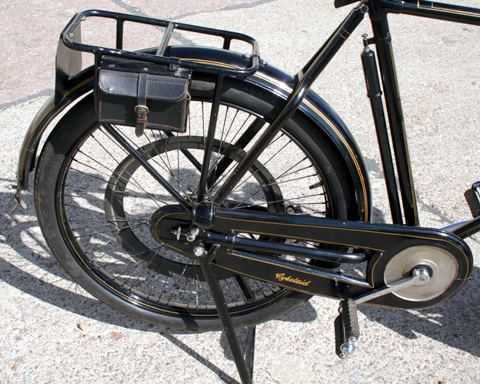 The specification included an Eadie coaster hub, rear hand-operated brake, number plate, rear stand and Brooks saddle. The wheels were 28″×1.75″, shod with Dunlop Roadster tyres. Alternatively, the complete front fork assembly was available for £32, as a conversion of an existing bicycle. 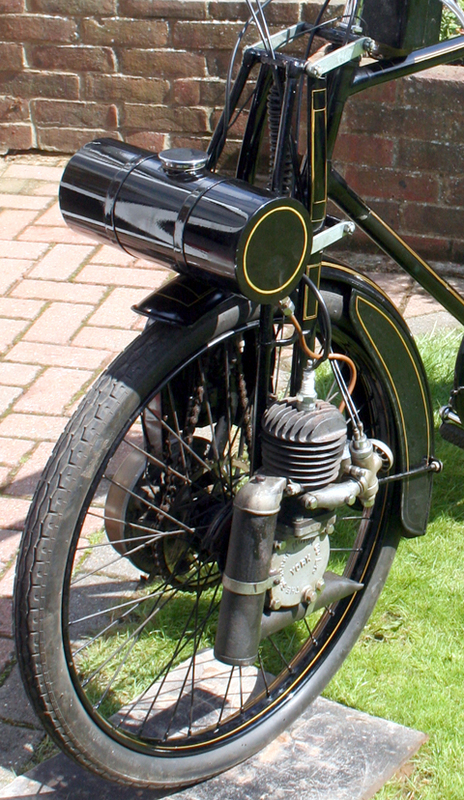 The early versions were not fitted with a front brake and, as mentioned above, the complete machine was fitted with two independent rear brakes. 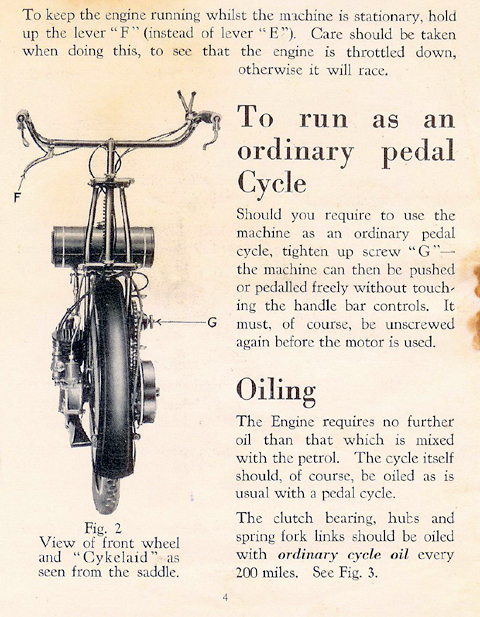 Presumably, when buying the front fork unit to convert an existing bicycle, one was also expected to fit an additional rear brake to the machine. Although the engine was lubricated by the petroil mixture, an additional oil tank was fitted. 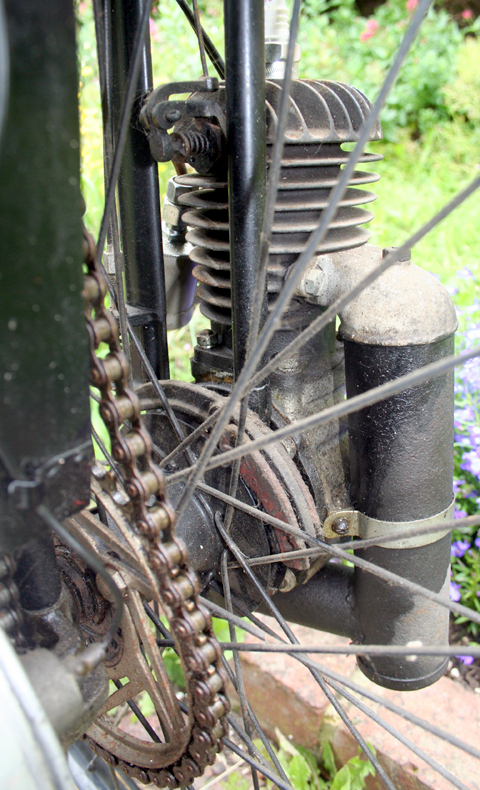 An oil pump driven by the front wheel hub delivered a measured supply of oil to the engine’s main bearings. 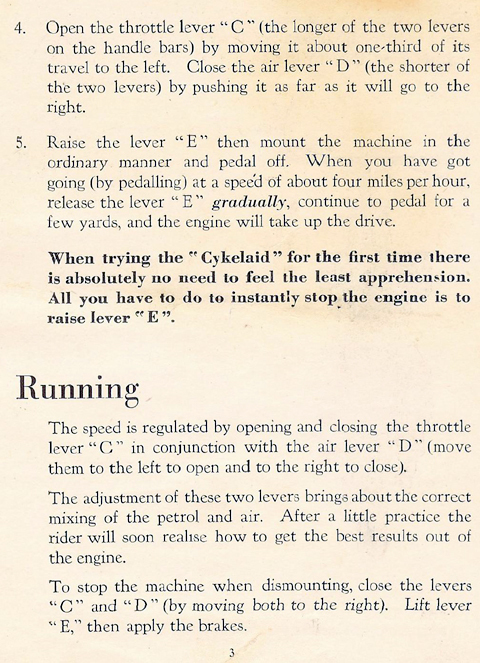 It would, therefore, be inadvisable to allow the engine to run for a long period with the clutch disengaged, since this would cut off the supply of oil to the crankshaft. None of the available options proved to be very popular with the buying public. 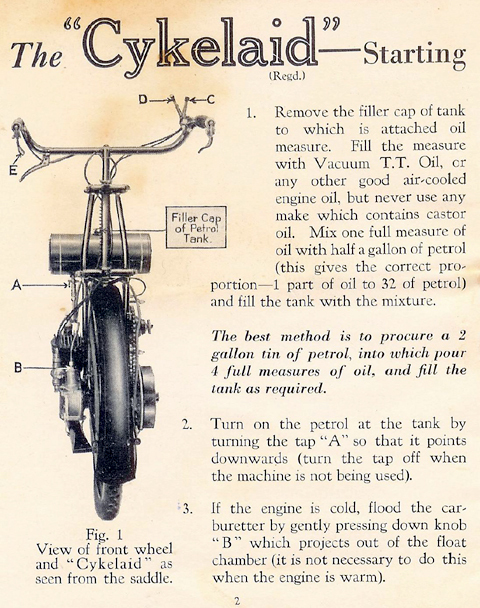 * 1922 Late that year modifications were made and the machine appeared as the New Cykelaid with simplified ignition and a pump system in place of petroil lubrication. Capacity was increased to 133cc and girder forks were added. 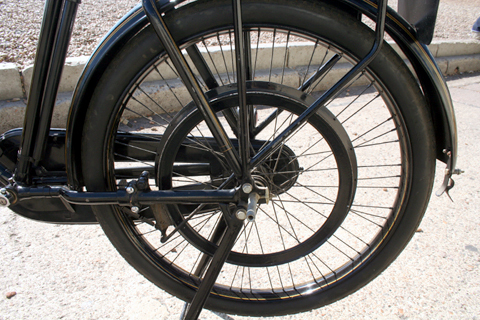 The wheel size was reduced to 26″×2″. 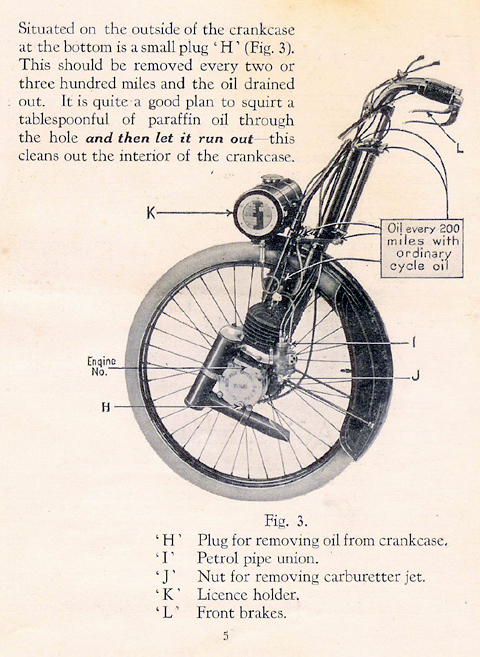 Protection for the rider was improved by fitting deep valences to the mudguard and by lengthening the exhaust pipe. A front brake was now fitted. 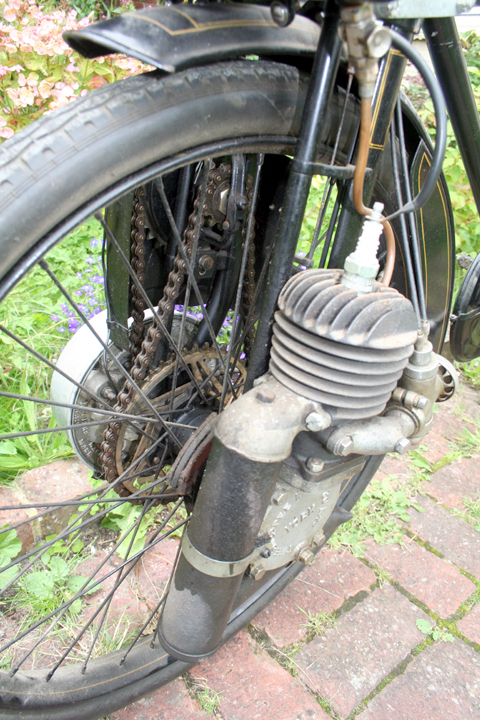 The 133cc two-stroke engine fitted to the left of the front wheel, chain drive via a counter-shaft and a flywheel magneto on the right that was driven by the main-shaft running through the wheel spindle. Although the performance was quite adequate, it had become outdated. 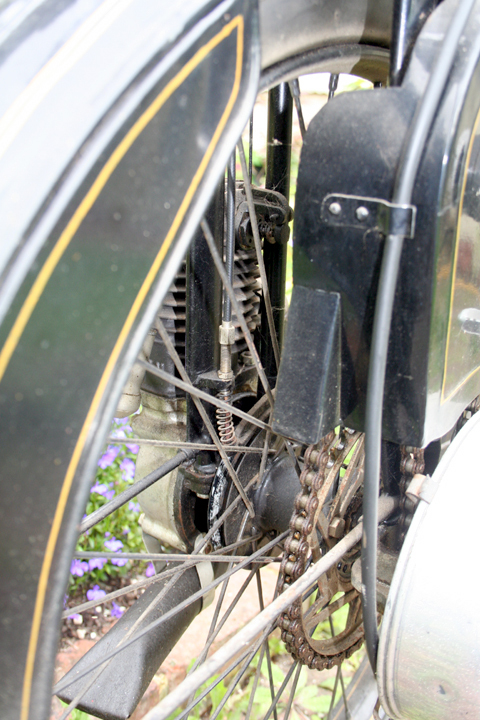 * 1925 A dummy-rim rear brake was adopted. * 1926 The last year of production. * Note: The engine unit increased the weight of a cycle by 35lb. It was claimed that it would propel a bicycle at speeds from 3mph to 20mph and that a 100 mile journey could be completed on a full tank of fuel. 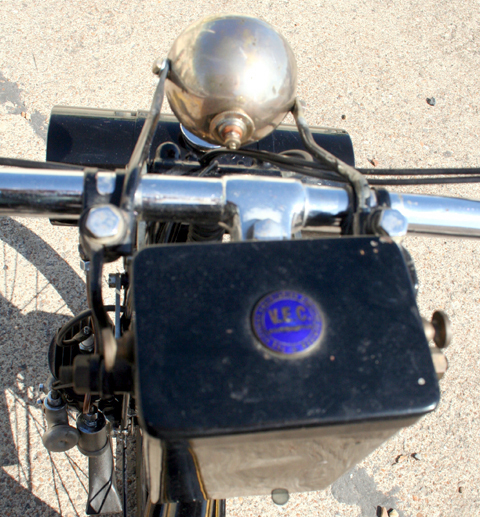 Compare the insignia on the flywheel cover, above, with that on the box below mounted on the handlebars. 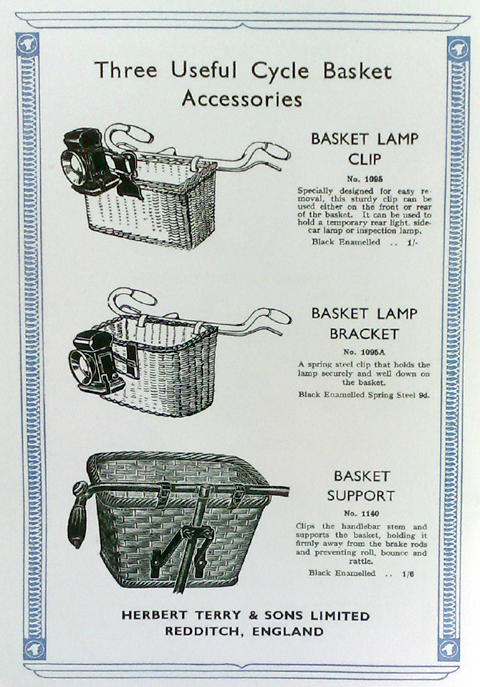 This rare accessory is an electric lighting set made by Villiers Engineering Co. 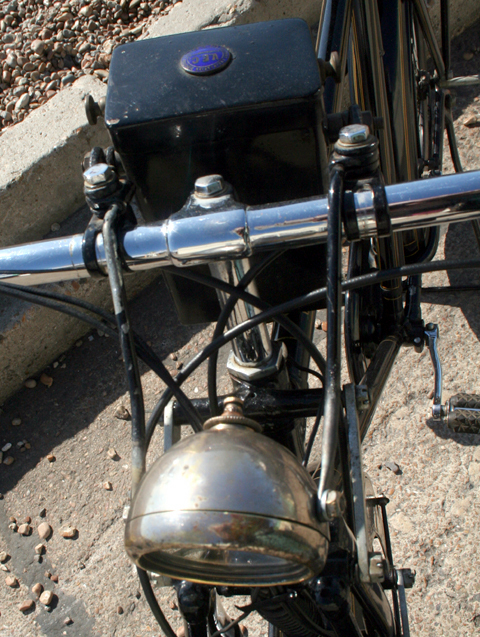 The front headlamp itself, while a rare electric lamp of the period, is not a Villiers unit. The lighting set requires a battery and wiring to make it work. 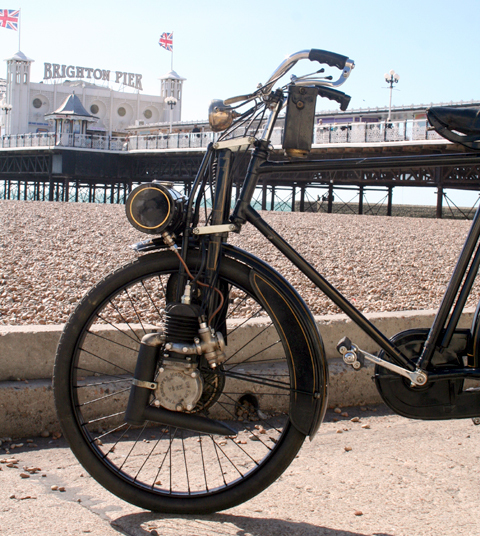 Although Villiers is very well known as a manufacturer of motorcycle engines, the company has its origins in the bicycle world: it was actually started by John Marston, of Sunbeam fame. 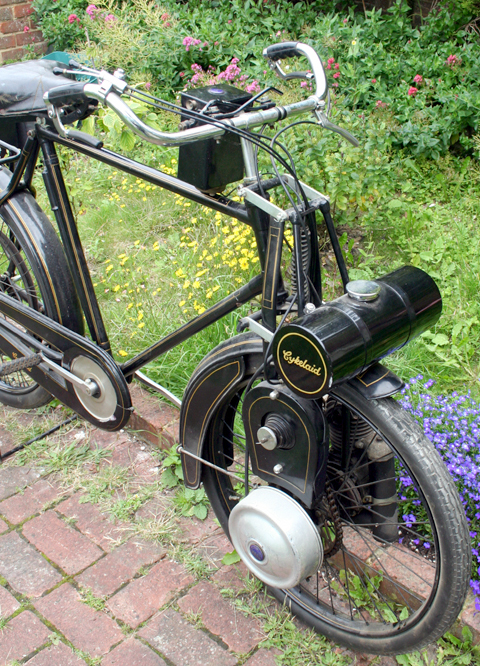 When he was unable to find bicycle pedals of good enough quality in Great Britain for his Sunbeam cycles, he sent his son Charles to the USA and they imported the necessary machinery from Pratt and Whitney. But the equipment was too bulky for their Wolverhampton factory, so John Marston purchased an engineering company, E. Bullivant, in Villiers St, to house the machinery. It was renamed the Villiers Cycle Components Company. Charles Marston ran the company, and subsequently purchased it from his father. 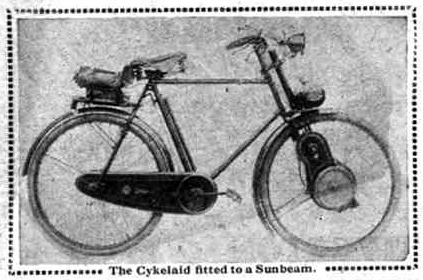 After supplying the necessary components for Sunbeam bicycles, they sold surplus stock to the bicycle trade. But they also recognized a demand for freewheel rear hubs for the new motorcycles being manufactured, so they designed, manufactured and supplied them, with great success. 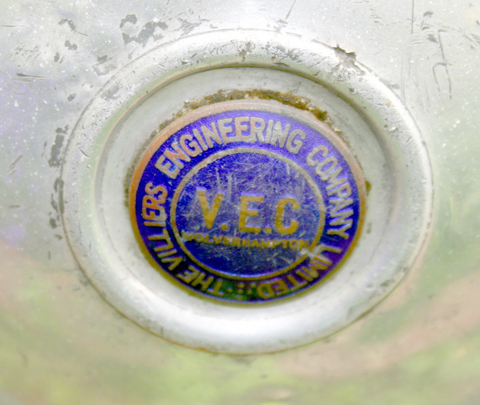 The first Villiers motorcycle engine was brought out in 1912, and the company name was changed to the Villiers Engineering Co Ltd. 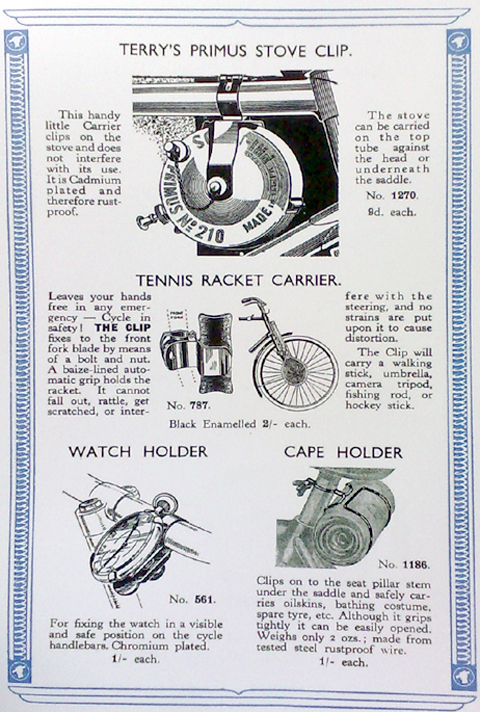 The Cykelaid advert above quotes a Brooks B75 saddle for the Ladies’ or Gent’s Cykelaid de Luxe. 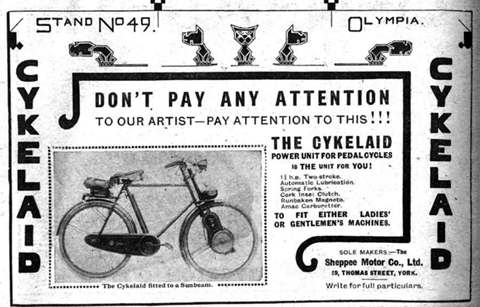 (Note also the mis-spelling ‘Cykelaide’ in the ad). 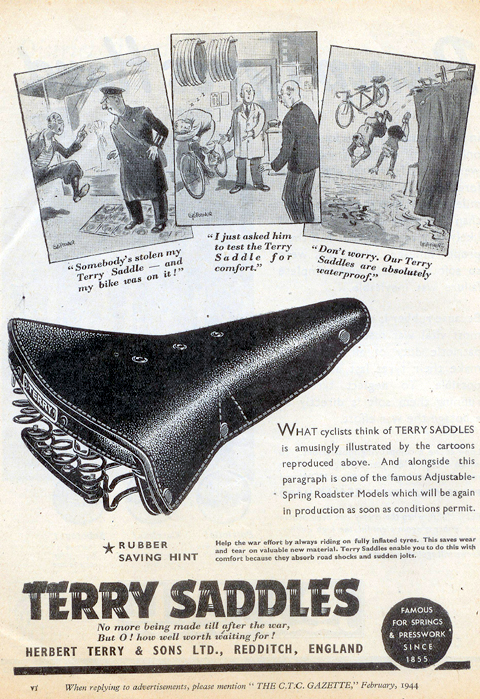 Though Brooks saddles were the most ‘upmarket’ British brand, a Terry’s saddle would also have been a sensible choice at the time. 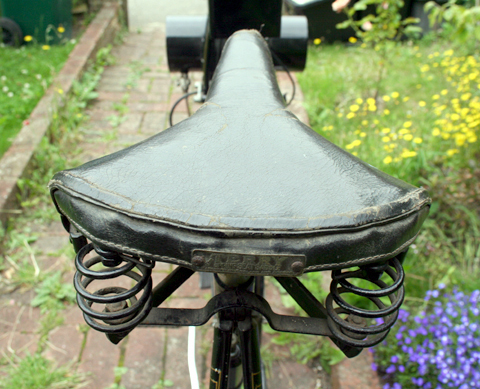 This Terry Spring Seat Saddle is a heavy duty model that’s certainly comfortable enough. 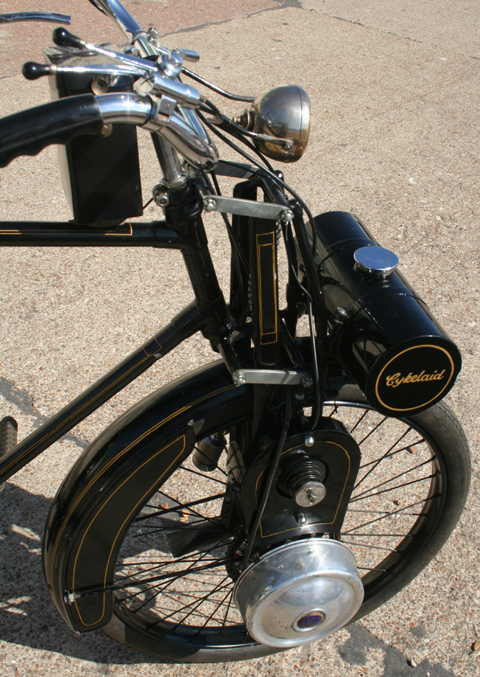 Although the Cykelaid has special front forks, the saddle provides the only suspension for the rider. 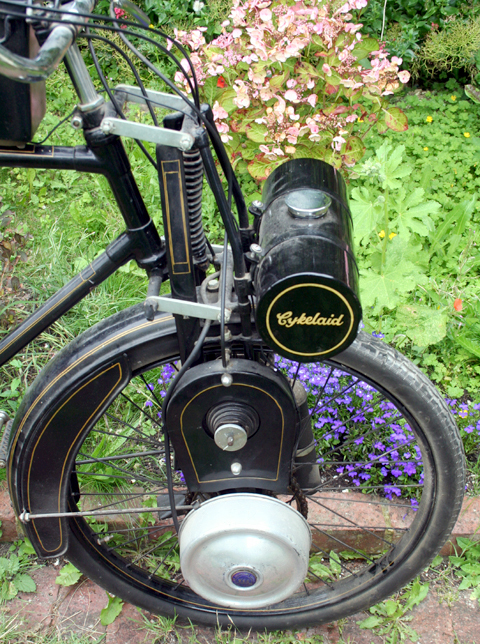 Coaster brakes were popular in the USA and in Europe, though less so in Great Britain. 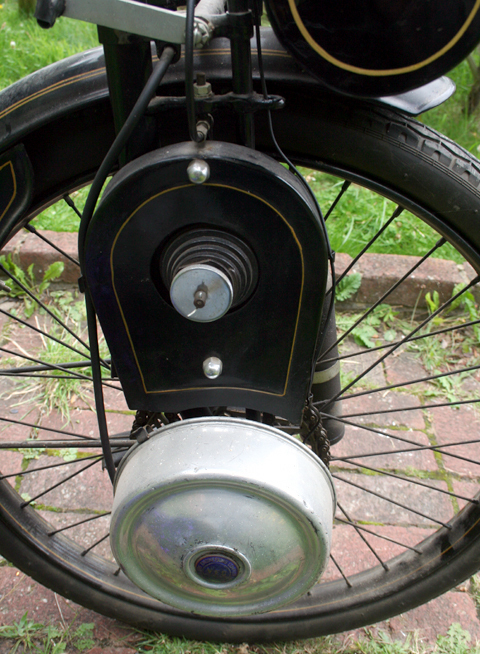 This rear brake is a very odd feature, operating onto a dummy rim rather than the hub. 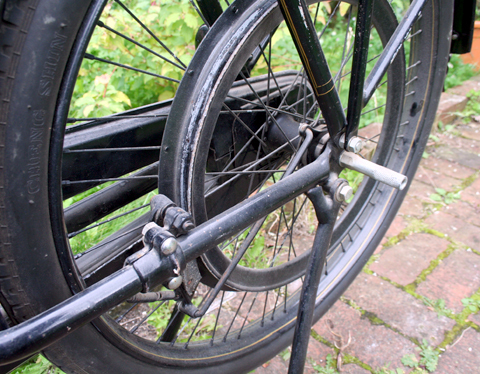 Apparently introduced by Sheppee for their machines in 1925 (though fitted to this 1924 model), you can see in the picture below how the coaster brake mechanism works on the rim. 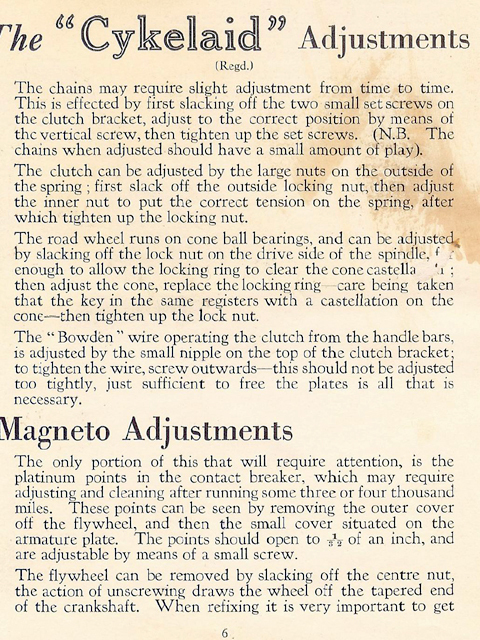 Motorcycles had recently started moving from belt drive to chain drive, so I assume there was a surplus availability of dummy rims at that time. 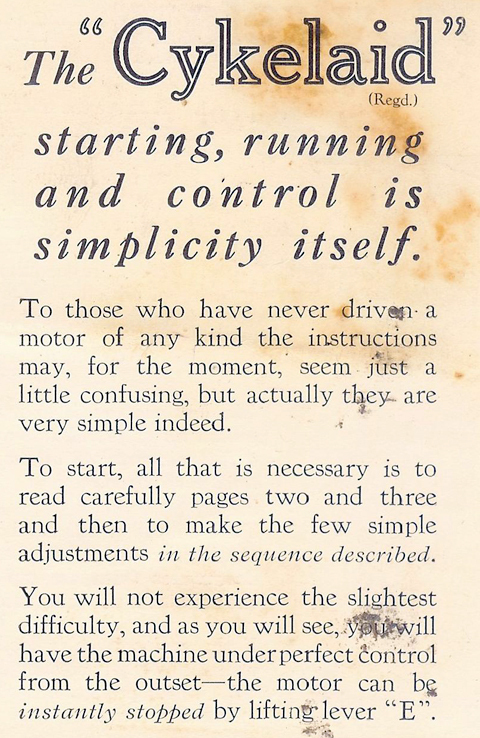 Here’s a copy of the instruction manual, which you can print out if needed. One disadvantage of bicycles was, of course, that unlike motorcycles, which fitted riders of most heights, bicycles were generally designed for taller folks. This was a hang-over from the early days of cycling when bicycles were used only by the aristocracy …who were generally taller. 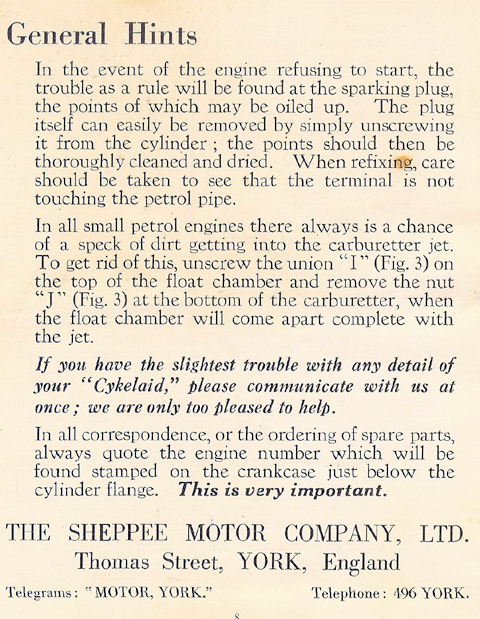 So, as well as selling the Cykelaid as a separate engine complete with front forks to be fitted to the customers bicycle of choice, Sheppee also offered a bespoke service. 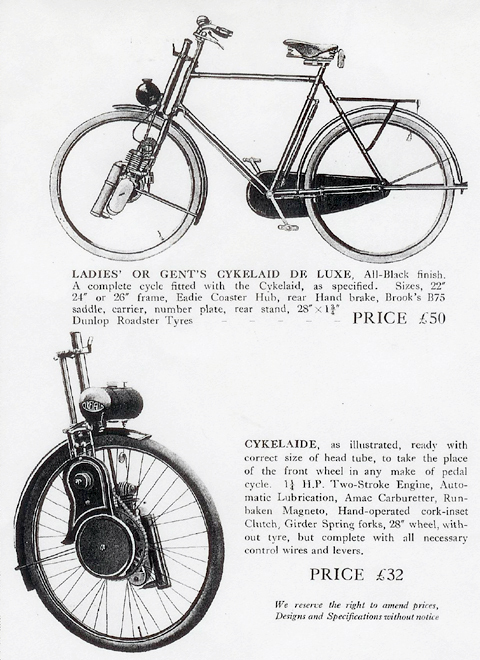 You can see in the illustration below the ‘specially built drop frame’ for ‘riders of below average height.’ This was available as both bicycle and tricycle. The company did not charge extra for this service. 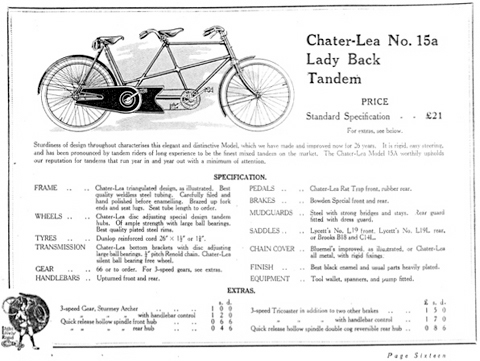 Also available was a Chater Lea tandem fitted with a Cykelaid. 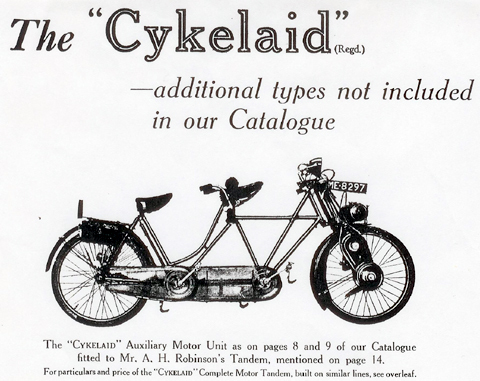 This was described as a Cykelaid Complete Motor Tandem. 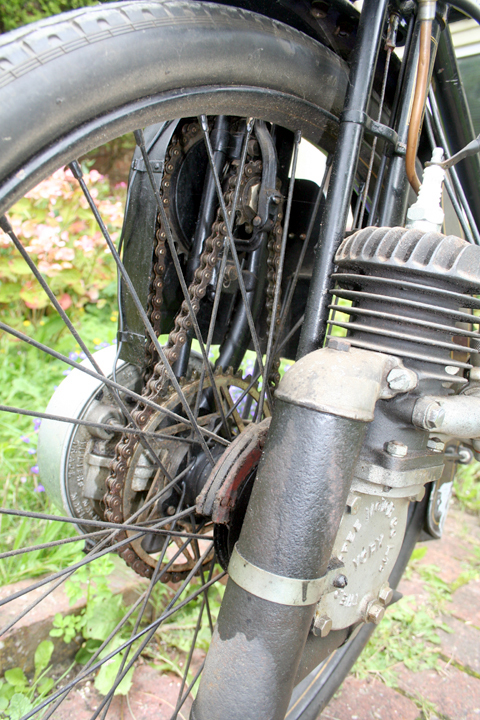 I’ve recently obtained and will soon start restoring a 1925 Chater-Lea Model 15a Lady Back Tandem. To view it PLEASE CLICK HERE or scroll down the pages on the right until you see it. According to my records, Chater Lea stopped making complete machines in 1907, in order to concentrate on component manufacture. 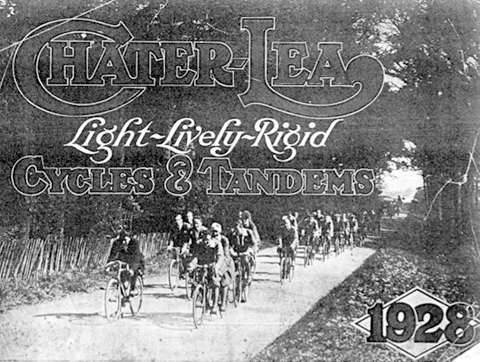 Orders for bicycles were passed to Raleigh, and Fred Scott took over their orders for tandems; having trained at Chater Lea, he set up his own company, F.H. Scott, for this purpose.